I have really great news: we found out that my mom’s breast cancer is only at stage one! It’s still an aggressive form, so she’s still going to get a mastectomy and have to go through chemotherapy, but at least now we feel more hopeful about her chances of recovery. In light of her treatment plan, my mom has requested some pretty hats. She doesn’t think she’s a hat person, in fact I’ve almost never seen her wear one, so a typical hat won’t do. She wants something differently-shaped, kind of turban-like, with a pretty button or other details. To Ravelry we go! Copyright Jejune. Click for pattern page. I immediately thought of the Dear Jane hat by Kristen Hanley Cardozo (a.k.a. KnittingKninja). This hat was originally knit in Codex and sold by The Sanguine Gryphon before it closed down. It features long tails on the brim that are woven through holes in the body of the hat to sort of cinch it up. It’s very unique. Copyright Sara Dudek. Click for pattern page. 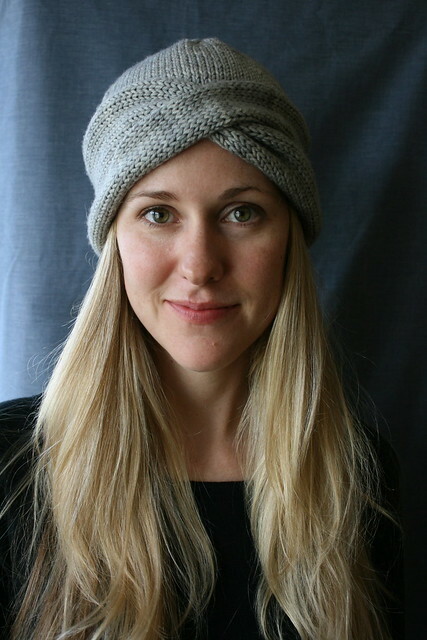 I loved this Knit Purl Turban by Sara Dudek immediately. It’s more cloche-like than turban-like in shape but it is very simple, sweet, and pretty. I have some leftover Malabrigo Twist I might use for it in a lovely rose color, or I would use Malabrigo Worsted. I think Malabrigo would make an ideal hat during chemo treatment because of its extreme softness. A merino/silk blend would do nicely, too, but I have yet to find one that I really like. 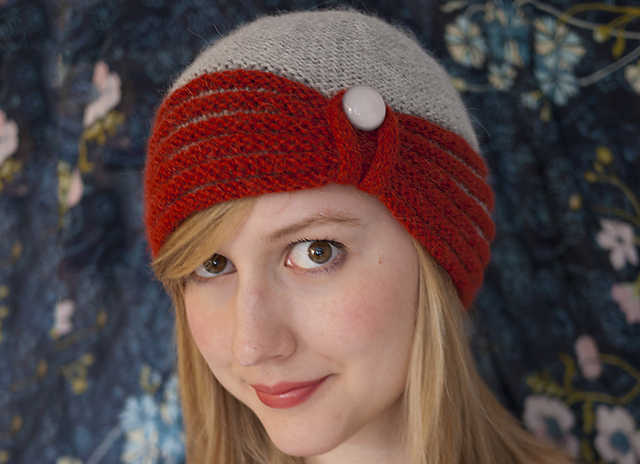 Holy cow, if you do a search for ‘cloche’ on Ravelry, you get about 24 pages of beautiful hats! Here’s just a few to give you a taste. Copyright Mary Keenan. Click for pattern page. 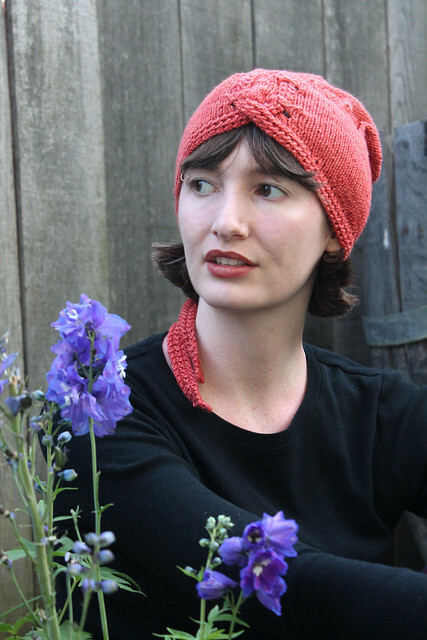 This Double Double Cloche by Mary Keenan is another simple yet lovely hat. Just some purl action, a nice button, and a rolled brim give it a great flair. Copyright Alexis Winslow. Click for pattern page. I’m sensing a theme! This hat (Zelda Cloche by Alexis Winslow) also features simple purl stitches and a button detail, but kicks it up a bit with color changes and is knit in a sport weight yarn, which would be nice and light. Copyright John Dukas. Click for pattern page. 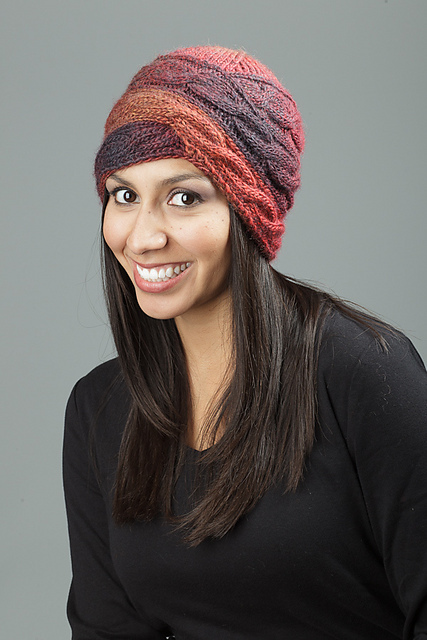 This Cable Swirl Hat by Patty Nance is doing all sorts of interesting things. It’s using something called a bargello knitting technique, has cables overlapping each other for much of the brim and body of the hat, and some kind of beaded closure (in the other photos). It’s one of those patterns I want to buy just to see how it was done! Copyright theyarniad. Click for pattern page. This one is the Nola Cloche by Hilary Smith Callis. I’m especially digging the simplicity here. 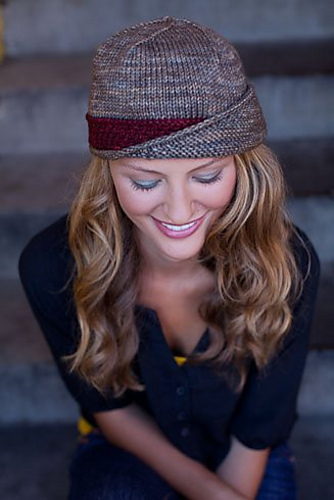 The sideways brim is knit with one cable row to form the pretty twist. 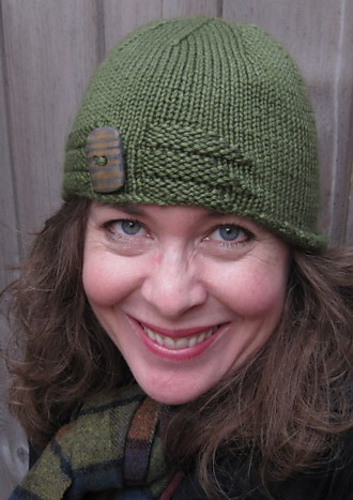 Plus it’s knit in bulky yarn, which we all know is one of my favorites for hats. Last but not least is the classiest of classy hats: the Lucy Hat by Carina Spencer. It has a beautiful, polished look and I covet it for myself. Simple stockinette, a woven-stitch band, and short row brim folded up for extra sass. I love it. Then again, I love pretty much all of Carina’s designs, because they’re just so damn gorgeous. Phew! That’s a lot of hats. 🙂 What’s your favorite classy hat pattern? Share in the comments below and feel free to link to your own Inspiration Saturday post! This entry was posted in designers, hats, InspirationSaturday by shoelaceswitcher. Bookmark the permalink. Glad to hear your mom’s news is as hopeful as it can be. I’ve knit chemo caps out of Finito before– soft as can be, and lightweight while still really warm. Ooooooh yes! Good excuse to get some more Finitio! Thanks for sharing your post. I’m so glad you got some good news! And all of those hats are gorgeous, I’m going to have to favorite them all now myself! That’s such good news about your Mom. My mom had breast cancer about 10 years ago. She only had surgery, and she is going strong now — and cancer free. Those are great hats. Whichever you choose to knit for her will make her pretty — and feel loved!